Its finally official – the Google Nexus 7 has been unveiled and it is ready to be pre-ordered right now. 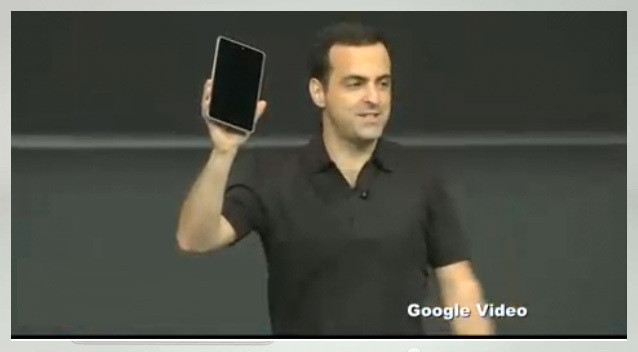 At its I/O conference today just a few minutes ago Google showed off the new Nexus branded tablet manufactured by Asus to the world. It boasts the all new Android 4.1 Jellybean, 7” IPS display with a 1280 x 800 resolution, a quad core Tegra 3 processor with a 12 core Geforce GPU and it comes with either 8 or 16gb of memory. Google is calling the tablet “Play Ready” – now what that means is it is built for content consumption through the Google Play store. Be it books, magazines, music, movies or applications. When you turn on the device your most recent play items are on the screen for quicker access. Clearly Google is going the media consumption route to promote this device – one of the key reasons why the Amazon Kindle Fire was a runaway success was how they managed to promote the Kindle Fire for media consumption through Amazon Prime. Google also unveiled a revamped Youtube application, a more optimized Google Maps and two games (Horn and Dead Trigger) showing off the power of the processor inside. Now all that sounds great and what seals the deal is the fact that the Nexus 7 will cost only 199$ for the 8gb version and 249$ for the 16gb. That is an unbelievable price for a quad core Tegra tablet packing so many software innovations. It will start to ship Mid July. All 6000 people present in the conference will be receiving a Galaxy Nexus, the all new Nexus 7 and the Nexus Q. I repeat, all 6000 present in the hall room.